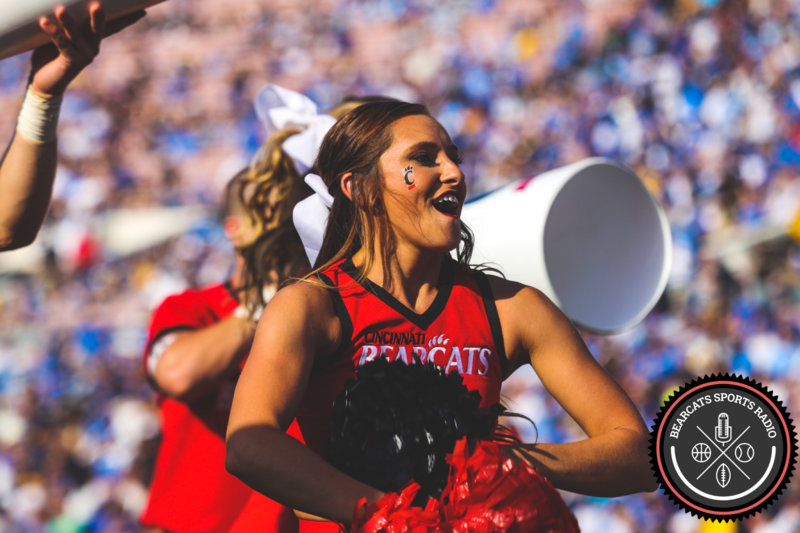 On Saturday the Bearcats return home after losing to both UConn and Memphis on the road in two of the most difficult places to play in the AAC to face Temple. UC is now 11-5 on the season and 2-2 in the AAC. The game is at 7:30 pm ET and will air on ESPNU. 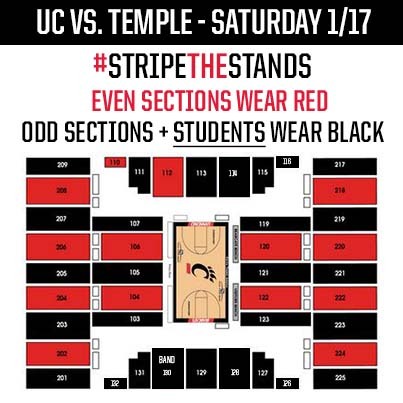 Fans are also encouraged to stripe the stands and show their hometown pride. Temple at a Glance: Temple is currently 12-6 and 3-2 after back-to-back loses to Tulsa and SMU. The Owls’ signature win was against #10 Kansas at home, 77-52. The Bearcats won both meetings last season against Temple (69-58 on January 14th in Cincinnati and 80-76 on January 26th in Philadelphia). UC leads the overall series 16-6. The Owls average 64.7 points per game, but only shoot the ball at 37.5%. The Owls lead the American in turnover margin (+2.8) and assist-to-turnover ratio (1.1-to-1) meaning they are good at taking the ball away and holding on to it. Key Players: The Owls have three players averaging double figures in scoring, including No. 25 junior guard Quenton DeCosey (13.9 ppg), senior guard Will Cummings (No. 2, 12.9 ppg), and No. 3 senior guard Jesse Morgan (12.6 ppg). DeCosey ranks 8th in the AAC in scoring. Six different Owls have 10 or more three-pointers this season. Temple ranks 2nd in the AAC in free throw shooting at 70%. Junior forward Jaylen Bond (No. 15) is 6’ 7” 225 lbs. and leads the AAC in rebounding with 8.5 per game. Cummings also ranks near the top of the AAC in steals (4th at 1.6) and assists (5th at 3.9). Prediction: Cincinnati is 27-2 at Fifth Third Arena since the start of last season. The Bearcats are 9-1 at home this season. In the AAC, defensively the Cats rank 1st in points allowed (54.7), 2nd in field goals (38%), 2nd in blocks (6.2), and 5th in three pointers (31%). This is a must win game for UC to stay in the conference hunt, and they will bounce back. The starting lineup of Caupain, Johnson, Thomas, Clark, and Ellis has to find a way to win in an electric Fifth Third Arena.